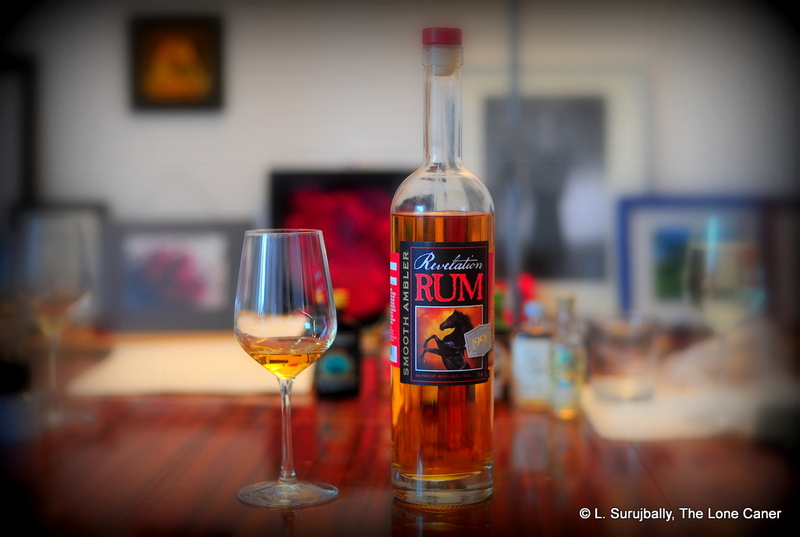 My friend Henrik from Denmark told me once that he really dislikes the rums of WIRD. “There’s just something off about them,” he grumbled when we were discussing the output from Little England, the development of the Foursquare Exceptionals, and the Velier collaborations. On the other hand, another rum-kumpel from Germany, Marco Freyr, has no problems with them at all, and remarked that he could absolutely pinpoint any Rockley Still rum just by sniffing the glass (I have since come the the conclusion that he’s absolutely right). Coming to this Bristol Spirits rum after a long session of Bajan bruisers made by the Compagnie, Cadenhead and Foursquare themselves, I can sort of see both points of view, but come down more on the positive side, because I like the variety of tones and tastes which indie WIRD rums provide. And this one? I liked it quite a bit. We hear so much about the rums of Mount Gay, St. Nicholas Abbey and Foursquare, that rums made by/from WIRD often get short shrift and scant mention. It’s not even seen as a true distillery of the sort that makes its own name and marks its own territory (like Foursquare, Hampden, Worthy Park or DDL do, for example). 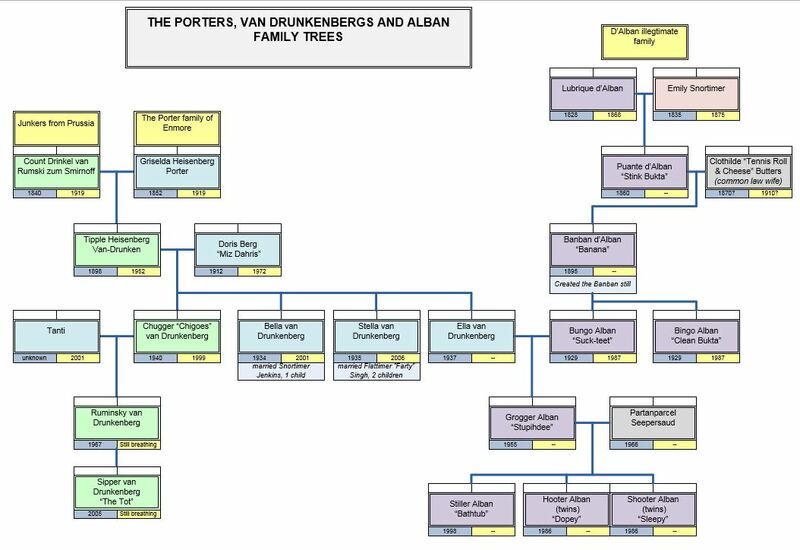 But WIRD does exist, even if the majority of its rums come to us by way of the European independents (most of its output is sold as either bulk stock to brokers, goes into the Cockspur brand, or to make the coconut-rum-liqueur Malibu which for some obscure reason, Grandma Caner simply can’t get enough of). The brief technical blah is as follows: bottled by Bristol Spirits out of the UK from distillate left to age in Scotland for 26 years; a pot still product (I refer you to Nikos Arvanitis’s excellent little essay on the Rockley still if you want to do more research), distilled in 1986 and bottled in 2012, finished in sherry casks for an indeterminate period. 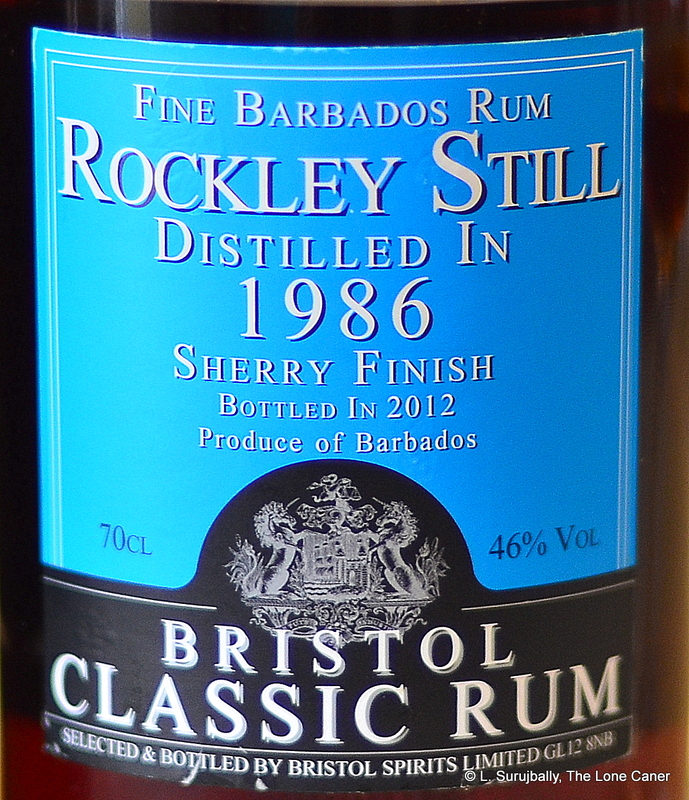 The strength remains at the Bristol Spirits standard 46% ABV, which makes it very approachable to the mainstream who want to explore further into how rums from Barbados can differ from each other. And differ it does. No smooth, well-constructed melange of pot and column still product here, redolent of spices and soft fruits. Oh no. For openers, this rum’s nose was meaty: like licking a salty maggi cube dropped into a pot of chicken stock liberally dosed with sweet soy sauce. All of this develops over time (fortunately, because I had soup for lunch and didn’t want any in my glass as well) into waxy pungency leavened with a sort of sweet rich fruitiness (cherries, ripe peaches, apples) which then further combined with a forceful sherry/madeira finish that at times verged on being overdone….even medicinal. The nose was so at odds with everything I had alongside it, that one could be forgiven for thinking this was not a Bajan rum at all…it nosed that different. Still, it was much better to taste than to smell. It was warm and reasonably smooth, though with a bite here or there to remind you it wasn’t fully tamed; its tastes were of caramel, dollops of thick dark honey on fresh toasted dark bread, camomile, thyme and cough drops. Iodine and medicinals are thankfully held way back (a pencilled-in line, not a brightly coloured oil by Frazetta, you might say). Also burnt sugar, stewed apples and some ripe cherries and the tart tastiness of soursop, ginnip and sour cream rounded things off, before lapsing into a relatively short, fruity, and honey-like finish that breathed easy fumes and then hurriedly exited the scene. Overall, it was a rich rum, full bodied, a little oaky, quite fruity after opening up, and that sherry influence — perceptible but in no way overwhelming — was enjoyable. 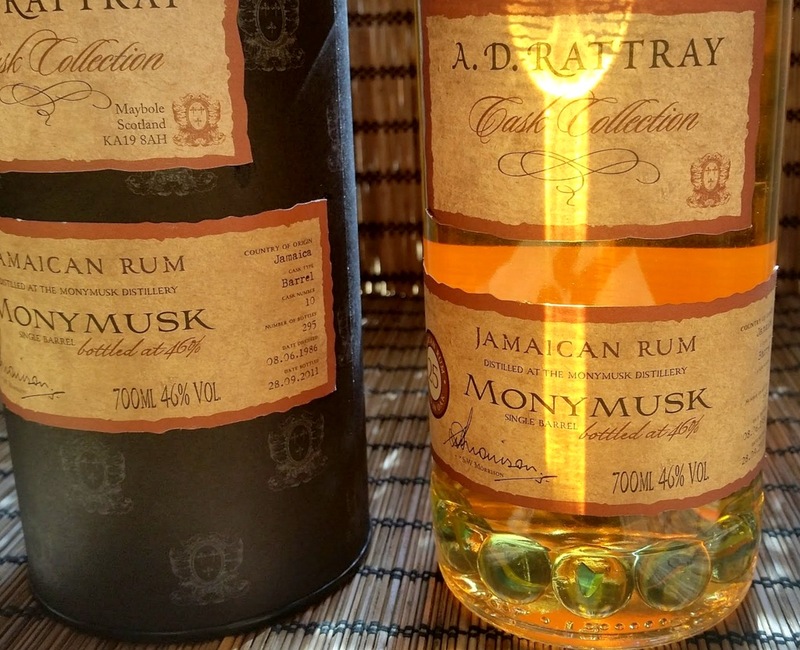 In fact, the overall integration and balance of this thing is really quite good, and it provides a pleasing counterpoint to more popular and better known rums from the island, which by itself makes it worth a try. 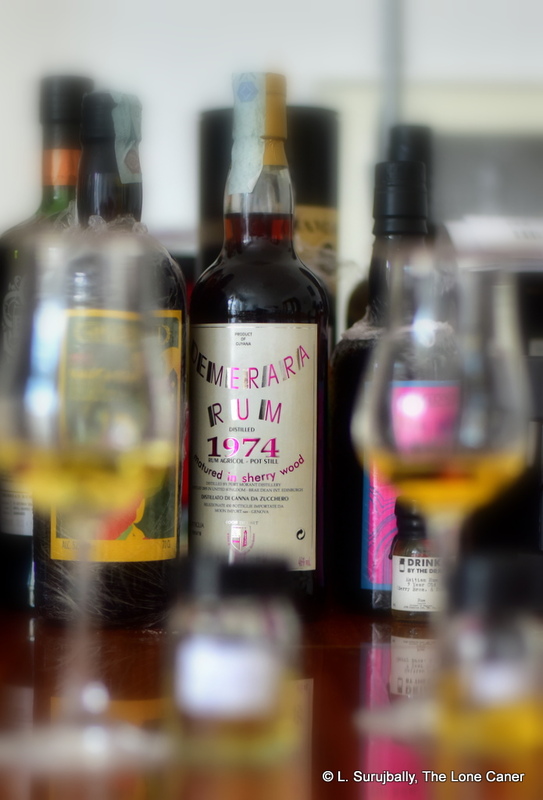 One does not have to be a deep-dive Bajan rum aficionado, parsing the minutest details of different vintages, to appreciate it for what it is, a well made Bajan rum that dares to go off on a tangent. There’s a reason I want WIRD rums to continue to make it to the public glassware, even if it’s just second hand, via the independents (now that Maison Ferrand has taken over, it’s only older rums from European brokers they’ll get, I’m thinking). They’re different, very different, existing in some kind of joyous parallel universe where mothballs, fruits and cloves mix it up in a dusty spice cupboard and the result is peculiarly drinkable. They are, in their own way and possibly because of their relative obscurity, fascinatingly off-base. I haven’t met many so far, but those I’ve tried I’ve liked, and sure hope more will turn up in my glass in the years to come. The SMWS has issued a few WIRD rums, the R.3 series…I’ve tried R 3.4 and R 3.5. 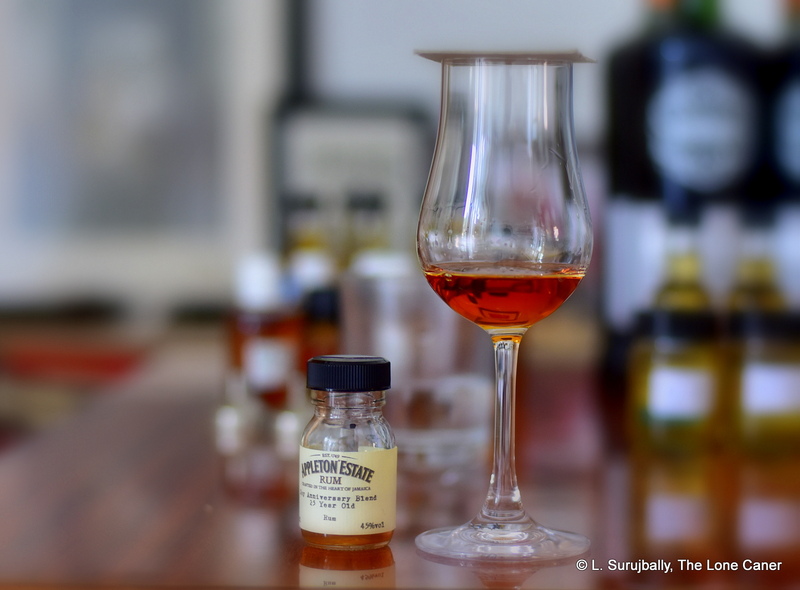 The Samaroli 1986 20YO Barbados Rum review also has some background information on the distillery and its stills, and I have one last 1986 vintage from Rensburger to write about. The Fat Rum Pirate’s 2016 review is here, and reddit had a shortform review just a couple of months ago. Every rum drinker who’s been at it for a while has a personal unicorn. It might not always be some hoary old grandfather of a rum, forgotten by all but barking-mad rum nerds, or the miniscule output of a distillery no-one now remembers (like the Heisenberg Distillery) — sometimes it’s just a rum that’s hard to get and isn’t for sale in local markets. Occasionally it’s even one they possess already but which evokes strong positive memories. One of mine has always been the Skeldon 1978, which was too rare or too expensive (usually both) for me to acquire. 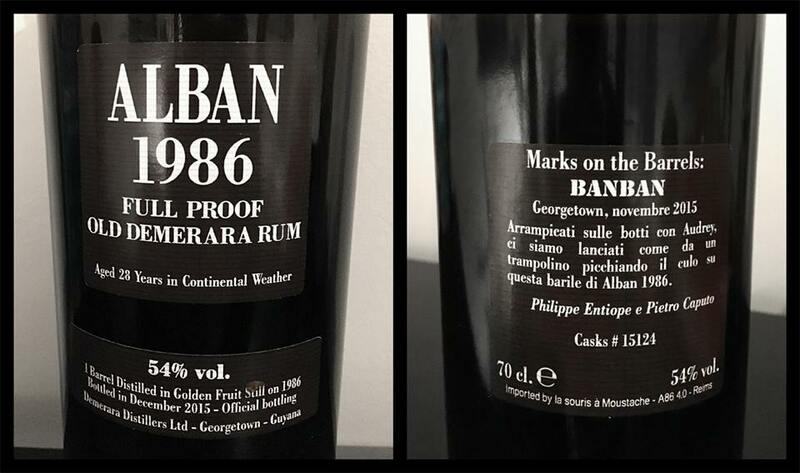 It finally became available to try at the Tasting of the Century that Luca Gargano tacked on to the formal launching of the new Hampden Estate rums in September 2018, and to say I jumped at the chance would be to understate the matter, not just because of the Skeldon itself, but because of the chance to try it in the company of blogging friends, along with other amazing rums. 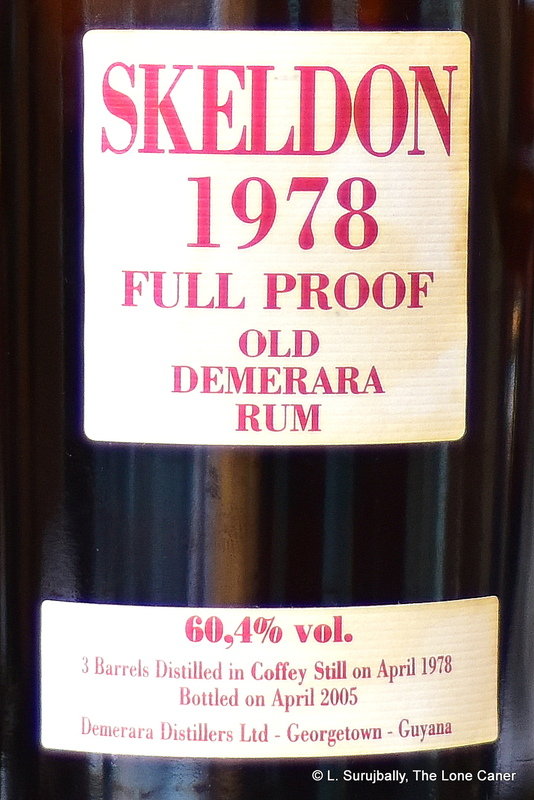 The history of the Skeldon 1978 bottling from a long-dismantled Savalle still is an odd one: the plantation is on the far eastern side of Guyana and the distillery has been shut down since 1960, though the original sugar factory’s remains continue to moulder away there, now replaced by a modern white elephant. It’s possible that the Savalle still which made it was taken elsewhere (Uitvlugt is the unconfirmed suspect) and this distillate hails from there rather than Skeldon — but certainly the “SWR” barrels ended up at Diamond, where Luca saw them gathering dust in the warehouse and convinced Yesu Persaud (the chairman of DDL at the time) to part with them. 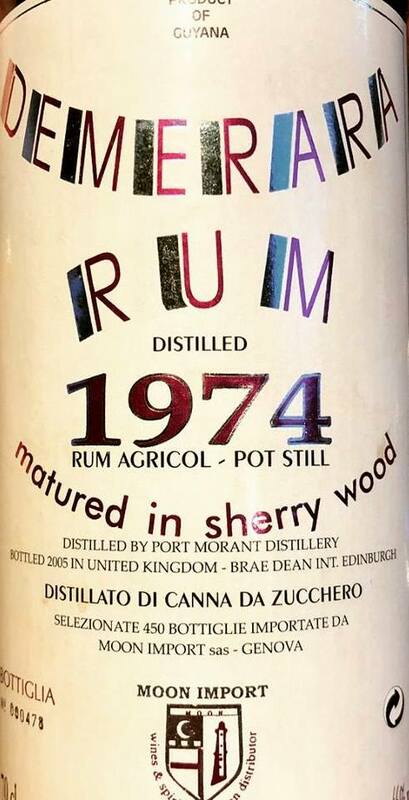 The 4-barrel 544-bottle outturn of the 1973 Edition was issued as was, but when the prototypes of the 1978 came to Genoa for final tasting, Luca noted something different in them, and later he challenged Mr. Persaud on what they were – and it was admitted that the three barrels of 1978 were deemed insufficient (whatever that means) and they mixed in some leftover 1973. 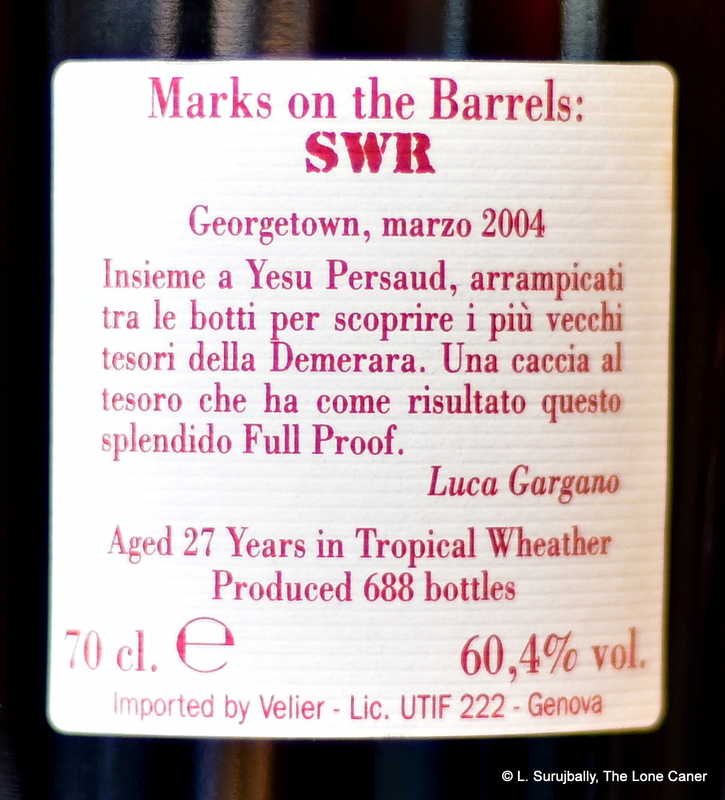 Luca was so pissed off that he sat on both editions for almost a year before finally issuing them to the market in early 2006, and what we are getting is a 688-bottle blend, the precise proportions of which are unknown — I was told the 1973 component was quite minimal. Although things at the Tasting were going faster than I was able to write (and listen), this was not a rum I wanted to be hurried with after waiting so long, and certainly it’s one with which to take one’s time. It unfolded gradually on the tongue, almost languorously and even at 60.4%, it was amazing how entirely under control it remained the entire time. Most of the tastes in the nose carried over, primarily anise, coffee and bitter chocolate, oranges, strong black tea, cumin, and that lentil soup / beef broth meatiness I remarked on earlier. But there were also more muted, subtler hints of papaya and fleshy fruits, aromatic tobacco, flambeed bananas and salty caramel. A rather dry note of over-roasted nuts came into play at the back end, a slight indeterminate bitterness (something like a manager who can never compliment your work without a closing criticism), but fortunately the muskier fruit and creamy notes ameliorated it for the most part. And while the finish was more a last bow on the stage than a true epilogue that added a few extra fillips of flavour, it was in no way disappointing, leaving me with a memory of coffee, nougat, salt caramel ice cream, fruits, raisins, licorice and light chocolate oranges. 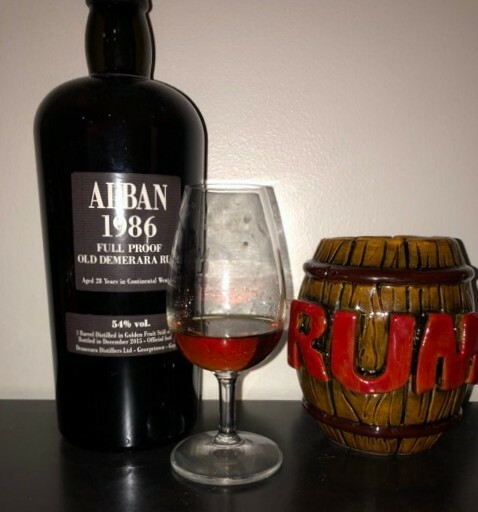 This was quite a rum, to be sure, and while I don’t think it quite eclipsed the Skeldon 1973, it sang its own distinct tune, hot and delicious, yet paradoxically quite clean and clear, with powerful tastes bolted on to a profile of generous complexity. 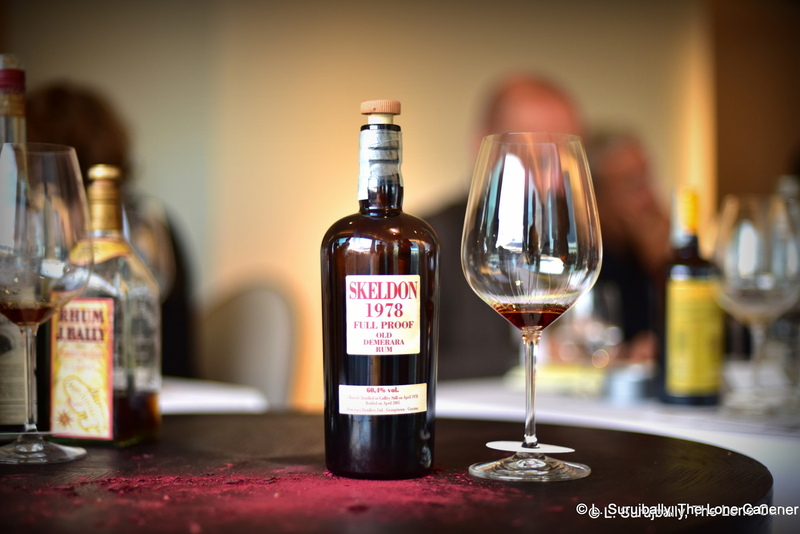 In fine, the Skeldon 1978 is a black drop of Guyanese-Italian oomph in a bottle, and making it a blend didn’t hurt it one bit. It’s a well-made rum, produced with care and affection, and through the alchemy of its selection, turned a mere rum into a Rum, big, bold, badass….one to be remembered. To have tasted it in tandem with other amazingly old rums and in the company of old (and new) friends, was an experience I’m not likely to be forgetting any time soon. Other bloggers have tried the Skeldon 1978, and their opinions are worth noting: this would be Cyril of DuRhum who described it in January 2015, and Marco Freyr of Barrel Aged Mind in September of 2014. Both remarked on the same slight bitterness I noted, with varying opinions on it. You will rarely find two rums of the same age from the same island more unalike than the Samaroli 1992 25 YO and the Appleton “Joy” Anniversary Blend. One is a fierce, cask strength rum, tightly focused, furiously tasty, with a complexity and balance that nearly broke my chart. 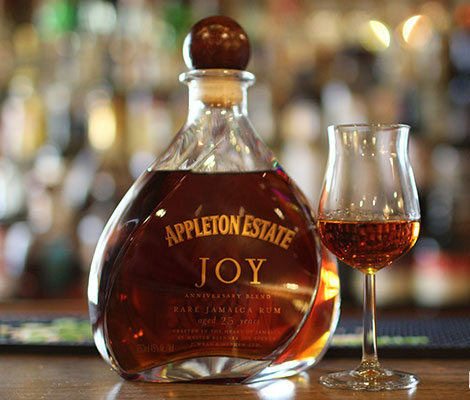 The other is a blended rum brought into being utilizing every ounce of more than two decades of experience which Joy Spence, Appleton’s Master Blender, brings to the the table. And yet, under the bare statistics that ostensibly set them apart, in both there runs the blood and bones of a Jamaican rum. 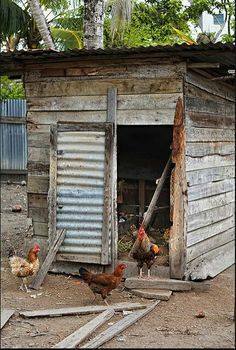 The “Joy” is as much from the island as the Song of the Banana Man, yardies, rice and peas and Three Finger Jack. And while the “Joy” is a blend and not so individualistic, not so strong, it is nevertheless a triumph of the discipline, a combination more art and alchemy than science, and a worthy cap to Ms. Spence’s career…until she makes the next one. 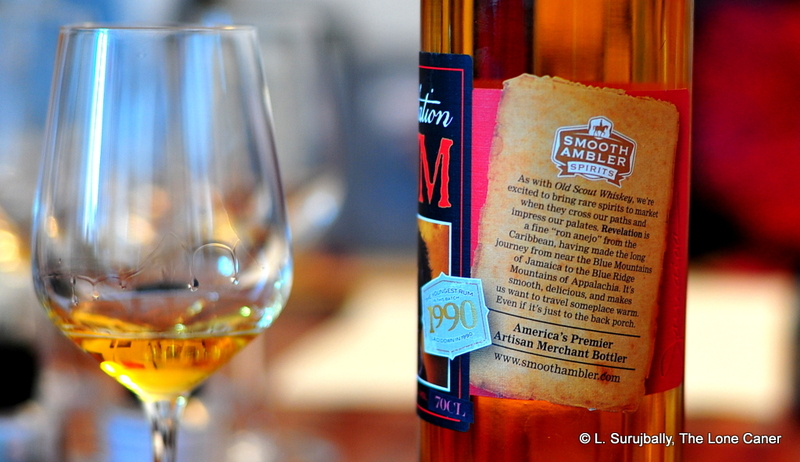 Some brief background notes: the rum was issued in 2018 to mark Ms. Spence’s 37 years with Appleton, more than twenty of which were as the Master Blender. It is comprised of rums at least 25 years old, with one — dating back from 1981, the year she joined the company — is in excess of 30, and it’s a blend of both pot and column still marques. With 9,000 liters made, we can estimate somewhere around 12,000 bottles floating around the world, all issued at 45% and costing a bruising $300 or more (which was the same price I paid for the Appleton 30 YO many years ago, by the way). 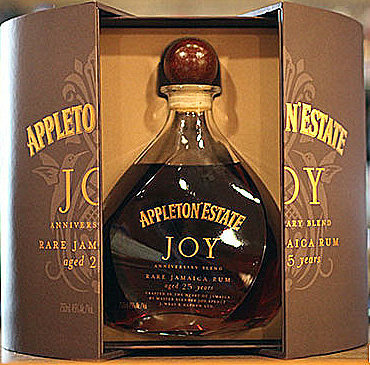 The “Joy” was, to me, a rum that seemed simply made initially, but developed into a really lovely and complex piece of work – I got the sense of a blender working right at the edge of her abilities, with excitement and verve and panache, and this was evident as soon as I smelled it. The nose began with a beautifully rich molasses aroma mixed in with a sort of dialled down crazy of musky and sharp funk – citrus, honey, oak, rotting fruit. I left it and came back to it over a few hours, and it presented leather, caramel, coffee, ginger, lemon zest with the faint dustiness of cumin. Oh and also nougat, and white chocolate. The palate was where it shone the brightest, I think, and I would never mix this elegant piece of work (that might actually be a punishable offense in some circles). It was nicely dry, with forward notes of honey, molasses, vanilla, caramel bon bons and dried coffee grounds, which were intercut with some lingering oak, just enough to provide some bite and tannins without disrupting the smooth flow. It was just a shade briny, not too sweet, and balanced off the deeper flavours with lighter ones — light citrus, ginger, cumin, and green apples and grapes did a funky little number off to the side, for example — and none of it was overbearing or in your face. In fact, part of the rum’s appeal was its deceptively unassuming nature – everything seemed tamped down and rather relaxed, but wasn’t really, just solid and well constructed, and remarkably complex and well-balanced to a fault. Even the dry and medium-length finish, which at that strength tends toward the short, was very enjoyable and softly lingeringly aromatic, closing off the sip with brown sugar, honey, flowers, crushed almonds and a little orange peel. Summing up, this was a wonderful sipping rum. It wasn’t one that took a single distinct note and ran with it. It wasn’t a fierce and singular Jamaican funk bomb or hogo monster that sought to impress with sharp and distinct tastes that could be precisely catalogued like a grocery list of all the things that enthrall us. It was, rather, a melange of softer tastes set off by, and blended well with, sharper ones, none of which ever seemed to strain or reach for an effect, but simply provided a slow parade of commingled flavours that somehow come together into something greater than the sum of its parts. Ms. Spence is perhaps one of the few legends we have in this curious subculture we inhabit, where owners commonly get more publicity and adulation than blenders (unless both inhabit the same corpus). I have never met her – our paths haven’t crossed, which is my loss, not hers – and yet how could anyone call themselves a rum lover and not know who she is? In some way, her hands have touched, her personality has influenced and her skills are evidenced in every rum Appleton has made in the last quarter century and more. My own feeling is that if she never makes another rum in her life, she will still be known for this one. The 30 YO was a little overoaked, the 50 YO remains too expensive, the 21 YO too indeterminate and the 12 YO too broad based – but this one, this one is a quiet triumph of the blender’s art. And if you want a more mundane proof of the rum’s quality, I direct you to the actions of Grandma Caner when I gave her some to try. She affects to a certain indifference my writing, expressing impatience with all these rums cluttering up her damned basement and I could see she wasn’t all that enthusiastic. But when she took an initially indifferent sip, her eyes widened: she just about swallowed her dentures in her haste to ask for more…you never saw an arthritis ridden hand move so fast in your life. The woman finished the sample bottle, cleaned out her glass, then my glass, and I could see her eyeing the bottle, perhaps wondering if it would be considered uncouth to ask to lick it out. Then she got on her old East German rotary phone, and spent the next three hours calling all her friends to go find this thing, and I swear to you, I am not making this up! Word of mouth and actions like that are an endorsement of the “Joy” which no amount of money could ever buy, and the cool thing is, the rum really deserves it. 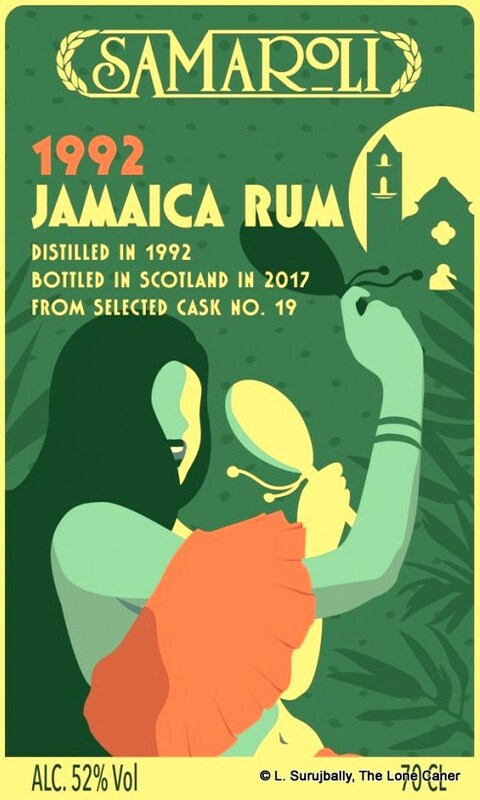 There’s a story I heard years ago, that of the many rums from his company, Silvano Samaroli’s own personal favourite was one of the first ones he bottled, the West Indies 1948. Who am I to rain on a story like that, speaking as it does of a man currently residing in the Great Distillery in the Sky, and a rum from so far back in time that most of us weren’t even a twinkle in our Daddy’s eyes, made when the world was an utterly different place? 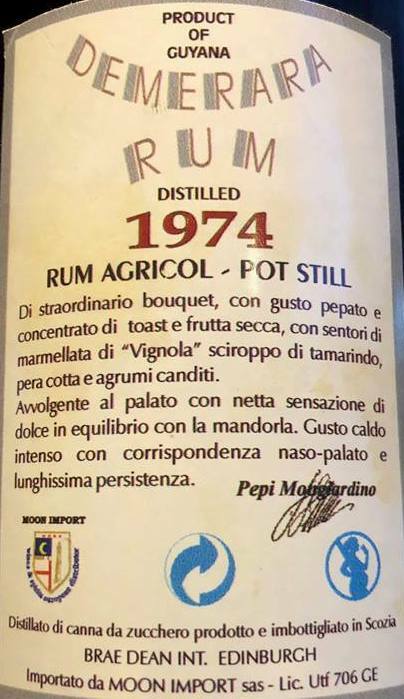 But for my money, of all the rums I’ve tried from this Italian outfit and from Jamaica (and that’s quite a few), this one is among the very best. 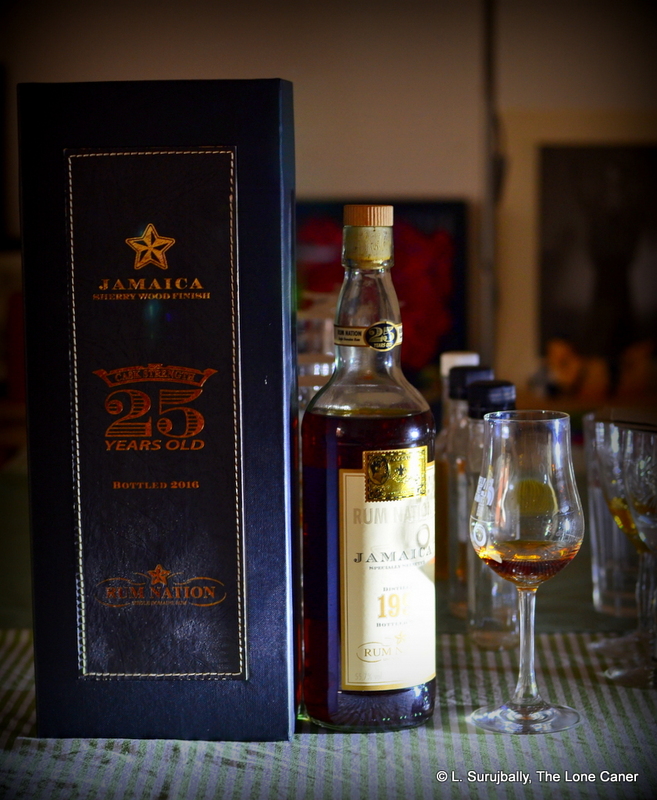 To cut straight to the chase and save you all a lot of reading time, I think it is a sublime drinking experience for anyone who treasures Jamaican rums. That might sound like a startling assertion, but it has a lot to do with the assembly, much with the balance, and for sure the overall complexity: and that started right with the initial nosing, which started slow, gathered momentum, and turned what we initially and indulgently thought was VW Beetle into a growling Veyron wannabe. Although the initial scents wafting easily from the glass are of paint thinner, acetones, rubber and some pencil shavings, for once these didn’t overwhelm or detract, but acted as a counterpoint to the rest of the nasal riches which followed – warm unsweetened chocolate, nougat, hibiscus flowers in full bloom, dust, dried coffee grounds, more light flowers with clear, delicate notes of something remarkably akin to freshly done laundry drying in the sun. Cedar, aromatic woody notes, honey tobacco. God, was this thing ever going to stop? Nope, there was more – a light dusting of brown sugar soaked in molasses, and vanilla. If you’re looking for funk, well, it’s there, but for once content to be a bit player and not chew the scenery. 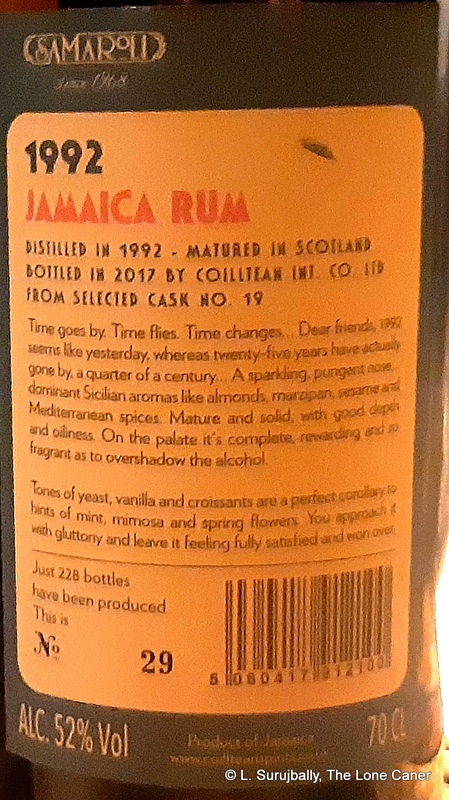 It seems almost superfluous to go through the factoids surrounding it so let’s be brief: it is from Hampden , though this is nowhere evident on the label (I picked that up online); pot still, continentally aged, bottled at 52% in 2017 from a single barrel (Cask #19, which means nothing to most of us) of 1992 stocks, 228 bottles issued, and there you are. 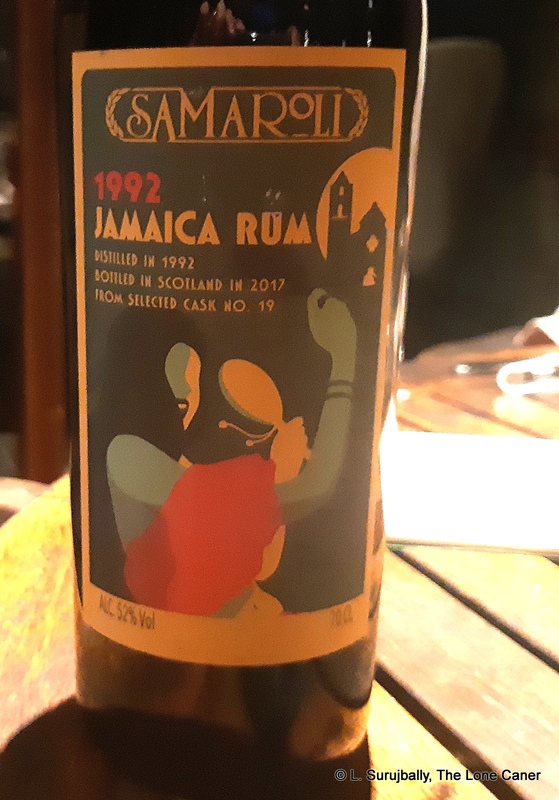 I don’t know what they did differently in this rum from others they’ve issued for the last forty years, what selection criteria they used, but I must be honest – the 1992 came close to blowing out my circuits. It’s restrained but powerful, and the sometimes-overdone flavour profiles of other high ester rums, has been toned down and handled with real attention and care. 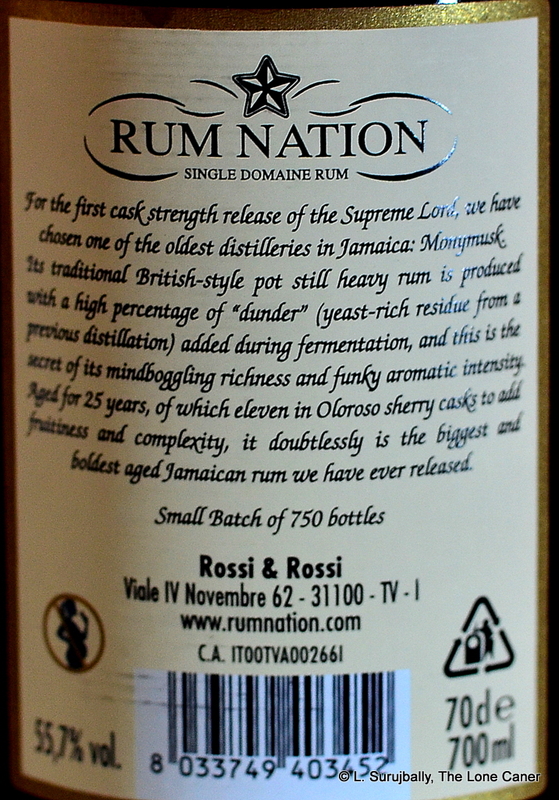 I can’t remember the last rum that excited me so much, that enthused me so much, right off the bat. Okay, that’s crap, there was the UF30E and the Sajous and the BBR 1977…but you get the point. I had to try it several times in the course of a single evening trying to poke holes into it, trying to find a flaw that would unravel the experience, make it more mundane, bring it to the level of other rums, but no, it stayed as spectacular at one in the morning, as it was six hours earlier when my friends and I cracked it. These days, with independent bottlers proliferating as they have, each one trying to outdo the other with a remarkable rum from yesteryear, and with Scheer’s old hoards being plundered like King Tut’s personal rum chamber, with old rums becoming impossible to find and harder to buy, I honestly believed my days of finding an undiscovered treasure were over. After trying the Samaroli 1992, I knew I was dead wrong…and happy to be so. There are still amazing rums out there to be found, often flying beneath the radar, teased out with a little luck, delving deep trenches in your wallet. This is one of them, a rum that shows what can be done when a bottler’s great selection crosses paths with a rum sleuth’s dogged persistence…and results in me writing about a rum that is made with what — in my opinion — is more than a small dose of pure magic. Writing about the Milroy Jamaican 26 year old, I rather sourly remarked that there was absolutely nothing to go on regarding the provenance of the rum. 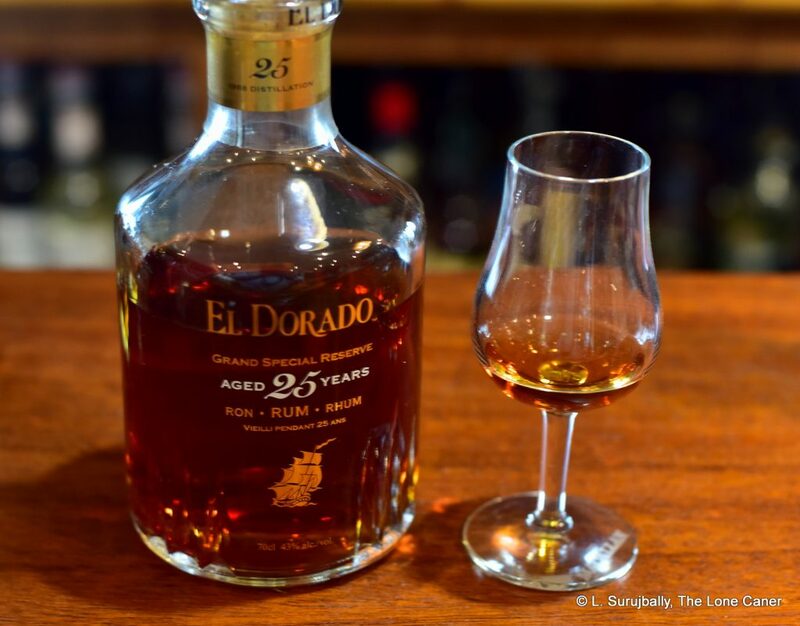 No such issue afflicts the 1988 edition of the El Dorado 25 year old rum, which is one of the most recognized premiums ever made. 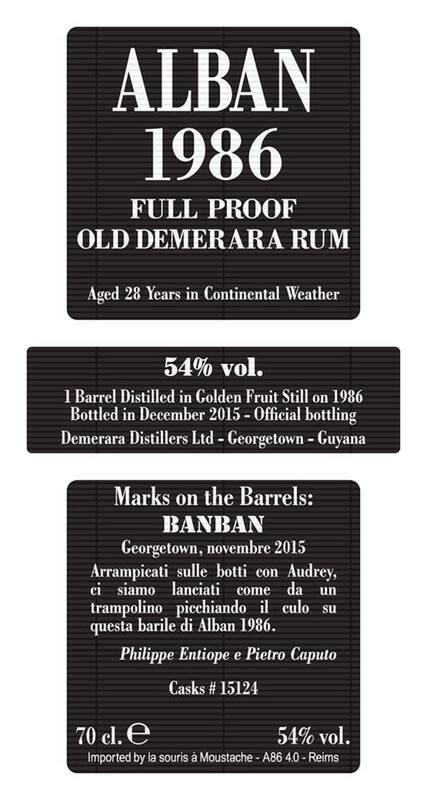 Even increased competition from other Caribbean (or independent) makers has done little to dull its lustre….except among the cognoscenti, who wouldn’t rinse their glencairns with it. Which, for the uninitiated, seems somewhat extreme. After all, just look at the stats: bottled at 43%, and it’s a true 25 year old rum – nobody has ever put a dent in DDL’s age statements – made by one of the most famous brands in the rumiverse, using the near legendary stills in a masterful assembly: various sources note that the marques of EHP (wooden coffey), PM (double wooden pot still), AN (French Savalle Still) are all part of the blend, and while there is some variation from batch to batch, overall the rum remains remarkably consistent. So what’s the issue? 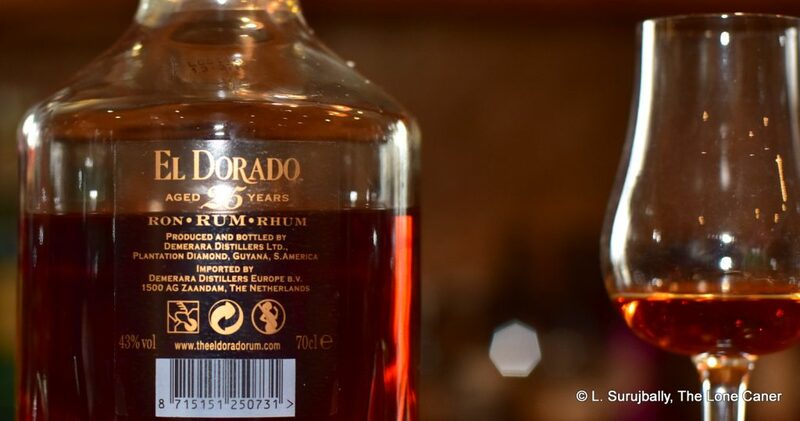 Well, by now, anyone who has read about DDL’s El Dorado rums is – or should be – aware that they practice dosing. That is, the addition of caramel syrup or sugar or whatever, in order to smoothen it out and make it more sippable, more elegant, more rounded. This is of course never acknowledged or noted on the label, and it took private hydrometer tests to ascertain that the El Dorado 25 YO 1980 version had around 50g/L of adulterants, and the El Dorado 25 YO 1986 around 39 g/L (I don’t have specs on the 1988). These additions certainly do their duty admirably – the rum is smooth, quiet, an awesome after-dinner sip. But there’s no free lunch in this world, and the price that is paid for that sippability is a muted profile – a muffled, muddled, addled, over-sweetened mess that obscures the high points of a rum that old. Nosing it makes it clear right off the bat. It’s slightly heated, fat and rounded – almost thickly aromatic. The dusky notes of anise and caramel, molasses, coconut and bananas are evident, but just barely. With some effort and concentration, raisins, apricots and prunes can be sensed…almost. It feels toned down, and that’s not just a function of the relatively low strength, but also the suppressive nature of the dosage. And even on the nose the sweetness is self-evident. This leads to a palate that is, at best, indeterminate – at worst it’s a travesty of what a rum aged for twenty five years should be. I spent half an hour sipping this rum in an attempt to take it apart, provide better tasting notes…and at the end, all I came up with was vanilla, toffee, molasses and licorice. There were some white chocolate and coffee notes. Vague flowers. Fleshy fruits, very ripe oranges, faint faint faint. And over it all was the sweetness and liqueur-like nature of the whole tasting experience which was simply too much. 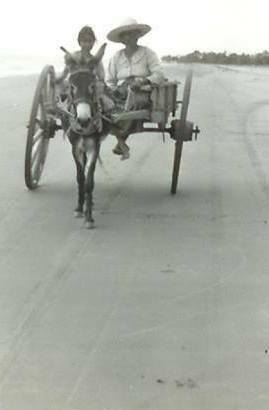 What this also did was to make the finish practically nonexistent. It was blattened flat by a sort of cloying syrupy-ness, and no subtle tastes really emerged to make the close an enjoyable one. If you think that this review of the ED-25 is relatively moderate and temperate – or even bland – you’re quite right, so let me provide some extra personal details: the day I tasted this thing I was hopping mad with it inside of five minutes, and the very first notes in my book started out “Oh for f**k’s sake! !” I wanted to write an R-rated review. I wanted to eviscerate it with foul language that would make a Mudland porknocker cringe. And eventually, I had to write this review four times from scratch lest my disappointed fury bleed too much into the narrative. And I’ll tell you why I was so pissed off – because I know there’s better under the hood of this deliberately triple-locked supercar. Because you can sense the quality, the brilliance of what could have been, lurking underneath the dreck — but are kept away from it by a freakin’ wall of additives neither asked for nor wanted, but which it was felt necessary to inflict. Because I’ve eaten labba and drunk creek water and want more out of the country. Because I know DDL can do, and has done, better. It’s like the Little Caner dumping on a school test because he was too lazy to study even though he knew the material inside out. And like his results when he pulls this crap, were they to be given, the ED-25 (1988) doesn’t deserve to be rated. I’m that incensed. So I’m not going to score this rum. What’s the point? Those who want a five hundred dollar hooch with a cool presentation and excellent age won’t care enough to read this; those who despise dosage and adulteration in any form will never spring the coin, and the more knowledgeable folks in the middle know there’s better out there for less – sometimes even from El Dorado – and will be neither surprised nor appreciative. I’m going to suggest that if you want a smooth, sweet, well-aged rum and can get it for free as part of a tasting or a sample set, then by all means, go for it. 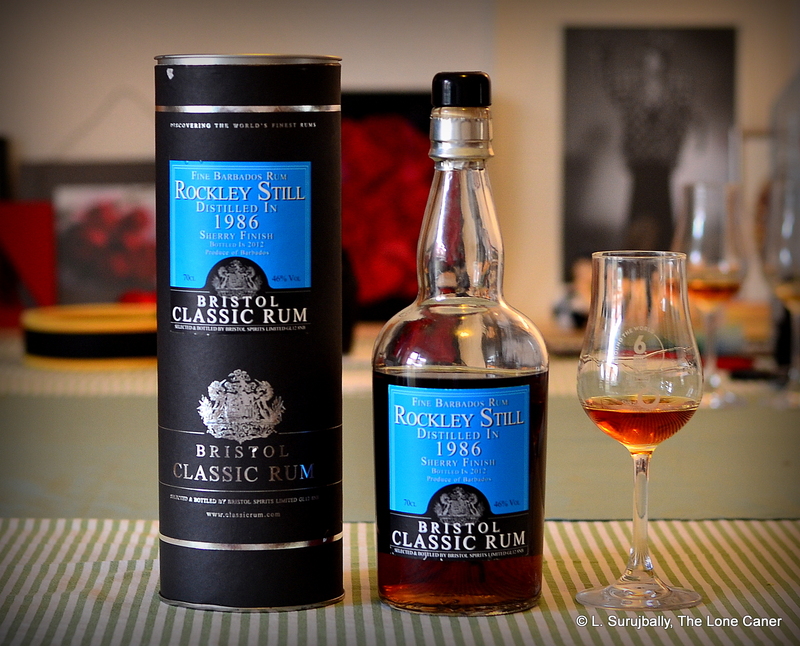 Want to impress people who know nothing about rum, here’s one to wow their socks off. Otherwise, look elsewhere. In the days after this post got shared on FB, it got a remarkable amount of traction in the comment section, especially in Rum Club Canada and The Ministry of Rum. Most agreed, and others were, I imagine, amused by the idea of the Caner losing his temper.